Leprechaun’s clearly end up in all sorts of predicaments but a stint in hell ranks as one of the least enticing prospects; nevertheless that’s where this particular chap has ended up and so we’re checking out Leprechaun Goes To Hell, an online slot from Play N Go with some clever bonus features and a progressive jackpot. 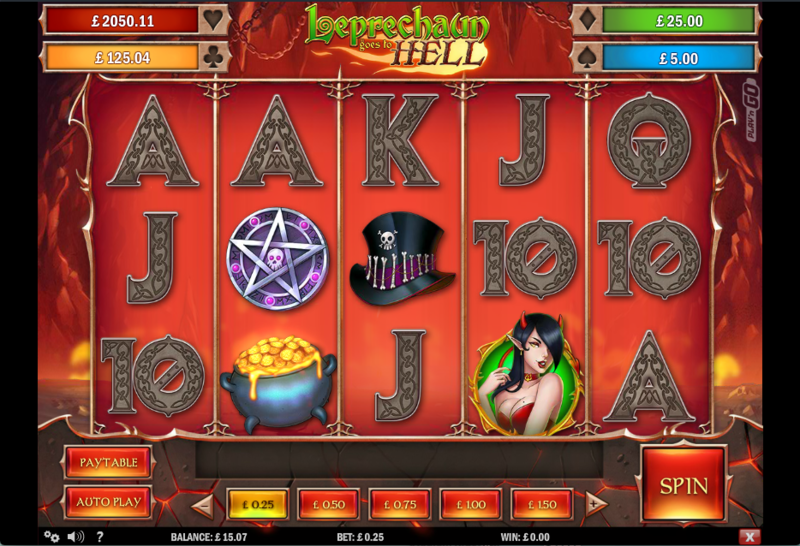 Leprechaun Goes To Hell is a five reel slot with three rows and twenty five fixed paylines; flames and a fiery haze from the backdrop to the reels which are framed by something sharp enough to be painfully prodded with. The higher value symbols are a top hat accessorised with tiny bones, a pentagram, the head of the devil’s pitchfork and an unpleasant green potion; 10, J, Q, K and A represent the lower values. The leprechaun and Evilene are wild and they will substitute for all others to form winning matches except for the pot of gold scatter icon. If the leprechaun and Evilene are active in a combo then there’s a 2x multiplier for that win. This is triggered when three Evilene symbols land anywhere in view and you will receive ten free spins on a three reel slot with an extra spin awarded each time a heart symbol lands on reel three (up to a maximum of 50). Each win you land will increase the temperature in the thermometer by a random amount up to the point where you start winning the progressive jackpot amounts shown above the reels. Bigger bets will increase the temperature faster. Trigger this by landing three or more of the pot of gold scatter symbols anywhere in view and you will receive ten free spins with a 2x multiplier for all wins; this round can be retriggered with more pots of gold up to a maximum of fifty free spins. Evilene only appears on reels two, three and four and if just two of her appear after a spin, the third reel will be respun as a second chance to land her again and trigger the feature. 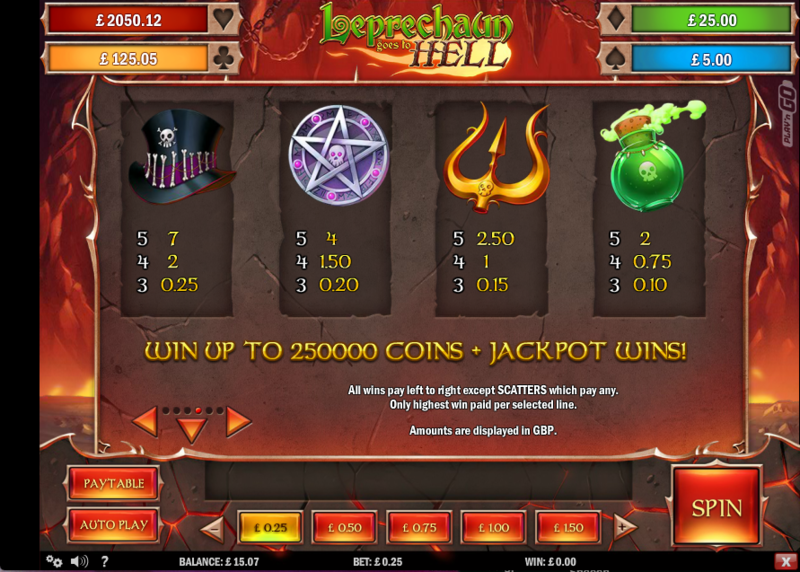 Leprechaun Goes To Hell wedges lots of action into the gameplay and it comes with lots of high quality graphics and animations; we triggered lots of Regular free spins and just the Infernal Free Spins (in Freeplay unfortunately) but you can’t have everything – it’a a slot we like and it comes with an RTP of 96.54%.